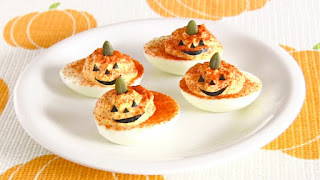 Deviled eggs are hard-boiled eggs, cut in half and filled with seasoned hard-boiled eggs' yolk. Deviled eggs are usually served cold. It is a great holiday or party food! 1. To make hard-boiled eggs, use older eggs because they are easier to peel. Place the eggs in a single layer in a saucepan. Cover with water at least an inch above the eggs. Put on high heat, gently, stir constantly (in this way, you can center the egg yolks), until water boils. When the water comes to a full boil, turn off the heat and cover the pan with a lid with no holes. Set a timer and let them steam in the hot water for about 15 minutes. Drain the eggs and cool immediately in cold water. Shake the pan to break the shells. Then peel. 2. Cut hard-boiled eggs into halves lengthwise. Gently remove the egg yolks, place them in a bowl, and mash them using a fork. 3. Mix A in a bowl, add the mashed egg yolks, and mix until smooth. 4. Transfer the mixture in a plastic bag or a pastry bag, cut off the corner of the bag to create a hole, then pipe it into egg white halves. 5. Sprinkle with paprika powder. Cut out nori sheet for the eyes, noses, and mouths of Jack-O'-Lantern faces. Attach the nori faces and pumpkin seeds on the eggs.